Holy places in Konark are the places where tourists visit to purify their conscience and to seek peace. A place is regarded as holy by the presence of the Lord and His pure devotees. Holy places in Konark will console your soul and will ensure a pious healing from your sorrows and grief. To offer your prayers and to attain spirituality a trip to the Holy places in Konark is must for every religious person. 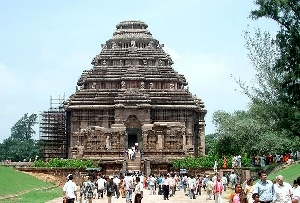 Tourist attractions in Konark are undoubtedly the famous holy places. The Holy places in Konark, India feature great architectural grandeurs and are considered to be very revered where wishes of the devotees are granted. One of the most stunning and sacred Holy places in Konark is the magnificent Sun Temple. The temple is one of the crowning glories of Orissan temple architecture and undoubtedly one of the spectacular monuments of religious architecture in the world. The Konark temple is widely admired for its architectural grandeur, intricacy and profusion of sculptural work. Konark sun temple resembles a massive chariot, with 24 wheels, pulled by seven straining horses, and features a three-tiered pyramidal roof topped off by a fine spire. The Sun - God's chariot is believed to be the seven days of the week, and the 24 hours of the day. The temple is one of the best examples of architectural marvel with brilliant chronicle in stone and impressive sculptures. Every aspect of life is represented here, and the sensuous imagery, depicts the characters of human love manifested in countless forms. Scenes from court, civic life and war are also done with great accuracy. Its magnificent konark Temple. The entrance to Sun Temple is reached by a broad flight of steps, flanked on either side by prancing horses, the whole symbolizing the chariot, in which the Sun-God journeys across the heavens. The temple proudly features among the World Heritage List. Adjoining the famous Sun Temple there is a beautiful Konark beach which offers a view of the spectacular sunrise and sunset. The famous Ramachandi Temple on the confluence of the river Kushabhadra and the sea is a must visit place among other Holy places in Konark. The Chandrabhaga Mela or Magha Saptami mela organized in the month of February is a splendid religious festival. Thousands of pilgrims across the world unite on the pool to take a holy dip in its holy waters. This place is also an important part of the Konark Holy places.